Posted on June 20, 2015 by Lisa Johnson, Ph.D.
Learning to write effective learning objectives is a fundamental skill for instructional designers because the alignment of learning objectives with instruction is necessary for ensuring the assessment of learning is focused on what learners are expected to be able to do after the instructional activity has occurred. Thus, learning objectives guide the creation of the activity and inform the assessment strategy for the instruction. One of the most popular strategies for writing learning objectives is to use the original or the revised Cognitive Taxonomy, which was initially refined in the 1950s by theorist Benjamin Bloom and several colleagues and later revised in the 1990s by Lorin Anderson and colleagues. Instructional designers refer to this taxonomy frequently as just the “Bloom’s Taxonomy” and, when they do, they are increasingly referring to the revised version of the taxonomy. However, many designers do still rely on the original taxonomy (see the image from the University of Georgia (n.d.) below for a comparison of the old and new versions). Notice the major difference between the original and the revised versions of the cognitive taxonomy is the use of active language in the revised so that, for example, level 1 (beginning/bottom level) in the original refers to “Knowledge” while the revised level 1 refers to “Remembering” — for both versions, there is an assumption that if the learner can perform at the higher more advanced levels they can also perform at the lower more beginning level. In that sense, the taxonomy is a scaffold of levels of thinking performance that learners can achieve throughout instruction and, theoretically and practically, the goal for instructional design is to build learners’ ability to perform at the highest more advanced levels of cognition throughout a series of sequences instructional experiences that develop skills upwards through the taxonomy. The most important thing to recall about using the cognitive taxonomy for writing learning objectives is that the verb you choose to describe the performance the learner will be able to do after the instruction indicates a corresponding level of cognition. Though this might sound simple, fact is it is one of the most confusing things to understand about the cognitive taxonomy for those learning to use it for writing objectives: you do not typically want to use the label for the level of the taxonomy as your verb, especially at levels 1 and 2. The image below, from ZaidLearn (2009), is based on the original Bloom’s Cognitive Taxonomy. 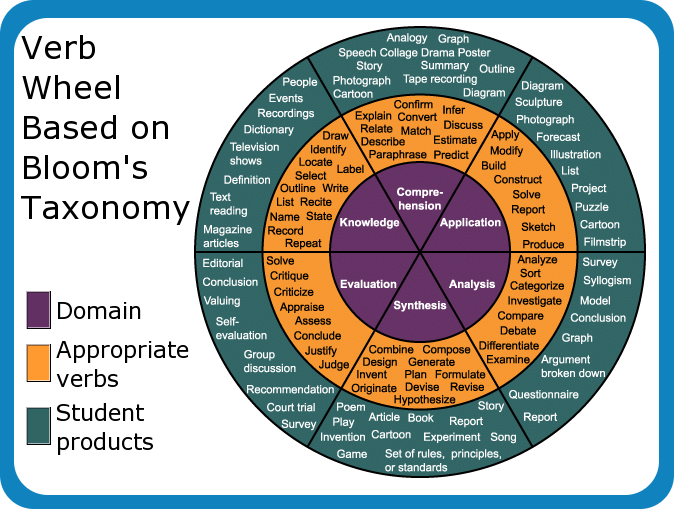 It shows the levels of cognition surrounded by common verbs selected to describe performance at that level and those are surrounded by activity ideas for how learners might demonstrate their performance. For example, it is impossible to really measure “Remembering” or “Understanding” and yet you can measure whether a student is able to recite, recall, list, describe, explain, select, list, identify, and so on. Therefore, always write your learning objective so that it includes a verb designating a performance that can actually be assessed. For assistance understanding how to write objectives using the cognitive taxonomy, you might wish to explore the Johnson (2008) Bloom’s Taxonomy: An Overview tutorial. The tutorial was created in the Shockwave Flash format so you will need to view it on a device that can render SWF (Flash) files. For additional inspiration about how the cognitive taxonomy can inform designs and to get ideas for lessons you will create in our course and beyond, explore the Johnson (2008) Bloom’s Taxonomy: Designing Activities tutorial, which is also in the SWF format. And, finally, note that one common method for writing objectives is the ABCD Method. This method is very helpful to use because it forces the designer to think through all of the elements involved in the learner achieving the objective: Audience, Behavior, Condition, and Degree. The ABCD Method for writing objectives assumes that the designer has also considered whether the objectives are SMART (Specific, Measurable, Achievable, Realistic, Timely). You can find many resources about writing SMART objectives and using the ABCD Method online. Or, you can start learning about these now by viewing the Campbell (2014) video, Writing Learning Objectives: The ABCD Method, which is about 9 minutes in length. This entry was posted in Educational, Scholarship and tagged Instructional Design, tutorials, writing learning objectives by Lisa Johnson, Ph.D.. Bookmark the permalink.